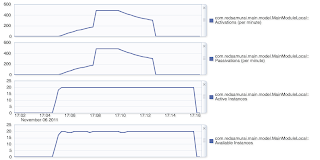 When we are talking with customers about Oracle ADF performance, very often we can hear such question - "Hey, ADF works well when there are few concurrent users, how it behaves when there is more serious load?". In order to answer this question I will publish series of posts, where we will study different parameters for AM pool tuning and test AM pool configuration under stress loads. Today we will see how stable is AM pool passivation/activation mechanism. 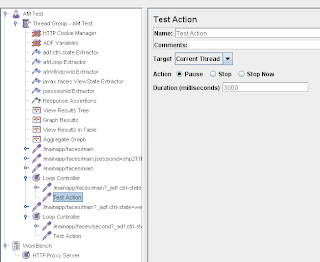 Stress tests are implemented with JMeter. 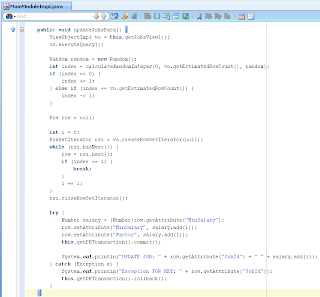 Check Chris Muir blog about JMeter configuration for ADF 11g. I'm using JMeter configuration file from Chris blog, however original file is updated with internal loops to repeat session requests. 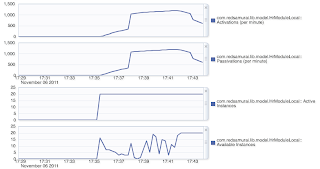 JMeter allows to run stress test with multiple parallel users, each users starts its own HTTP session. 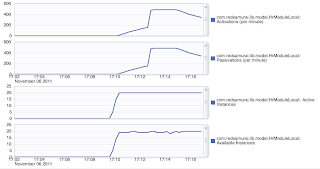 It is not enough for stress test, additionally I would like to repeat user action within the same HTTP session - its why internal loops are needed, these loops allow to iterate through the same requests multiple times. This test with 25 online users is slightly above Referenced Pool Size = 20. We should experience passivation/activation behavior. 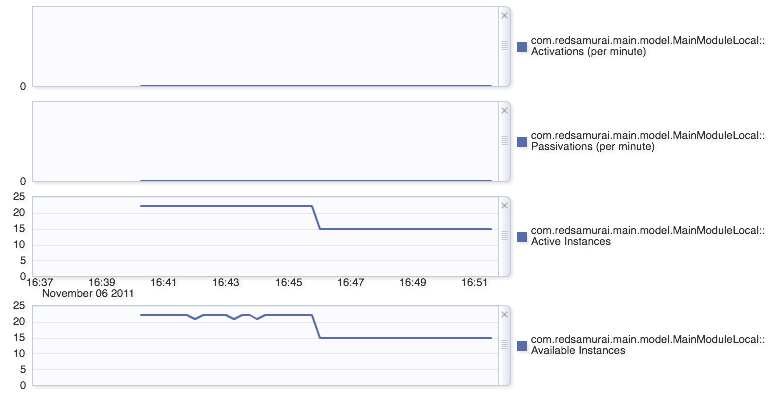 As you can see, even Maximum Pool Size = 30, active instance size is not exceeding Referenced Pool Size. Conclusion: AM Pool is strong enough to handle stress peaks with online users greatly exceeding number of AM Pool Size and and AM Referenced Pool Size. 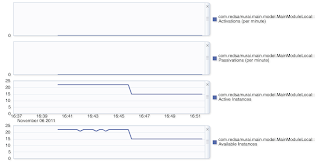 However, in your system you should try to maintain AM Pool sizing as close as possible to expected number of online users - this will help to avoid performance costly passivation/activation operations. As usual a useful post Andrejus, thank you. Can I ask a question on the "AM Maximum Pool Size" setting. Up to now I thought that was a hard limit that when hit, the framework will throw errors. Is that your understanding? An alternative to that last question, can you see any reason not to leave the Maximum Pool Size as the default 4096 value? 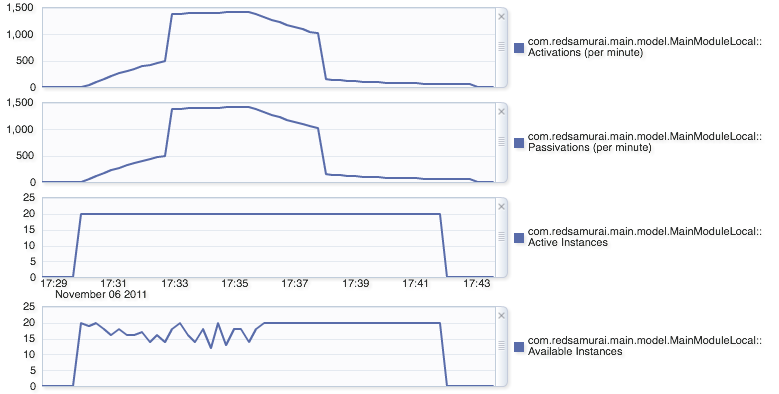 Also in the last Pessimistic scenario, against diagram 3c.png you comment "we can see that we were using at some moments more than 40 (20 per each AM) database connections". If that's the case, in diagrams relating to the Pessimistic scenario, shouldn't we see the Active Instances grow above 20 to reflect the growth in the pool size? 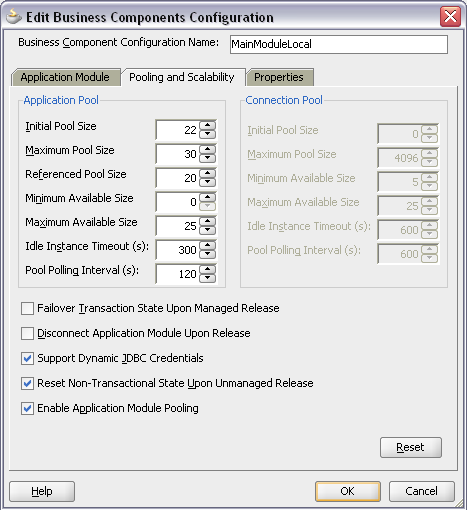 "AM Maximum Pool Size" - based on stress test, this setting is not a hard limit. If "AM Maximum Pool Size" is set to smaller value, framework just executes slightly more passivation/activation, but still serves all users (however number of passivation/activation mostly depends on "Referenced Pool Size"). As per doc, "AM Maximum Pool Size" should be 30% more than expected concurrent number of users, it looks like there is no need to keep 4096 - at least is not giving any visible performance effect to keep "AM Maximum Pool Size" large. However I will continue tests on this. At the same time, I don't see so far any reason not to leave "AM Maximum Pool Size" = 4096, unless AM Pool is wasting memory when this value is set to be large - will need to test memory consumption. For Pessimistic scenario - yes, its what I was thinking as well. Why we don't see more than 20 Active Instances. I guess, during stress test conditions, AM Pool maintains some AM instances in transition state (moving from Active to Passive). 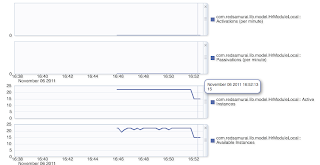 May be its not able to switch AM instance fast enough, its why it consumes slightly more DB connections. I was doing more tests, situation became more clear now. - "AM Maximum Pool Size" is not hard limit. However, on very high load and when WLS is running out of free resources - AM pool expands and creates more active AM instances, then specified by Referenced AM Pool size. It keeps growing until "AM Maximum Pool Size" and then it stops serving new users. However, this happens only with really heavy stress test - usually AM pool tries to passivate/activate fast and stay in limits of Referenced AM Pool size - rarely growing higher and reaching Max size. - We saw more DB connections on high load, because of internal AM connection for passivation/activation. I declared jbo.server.internal_connection for both AM's and pointed to separate dedicated Data Source - now number of consumed connections stays stable. 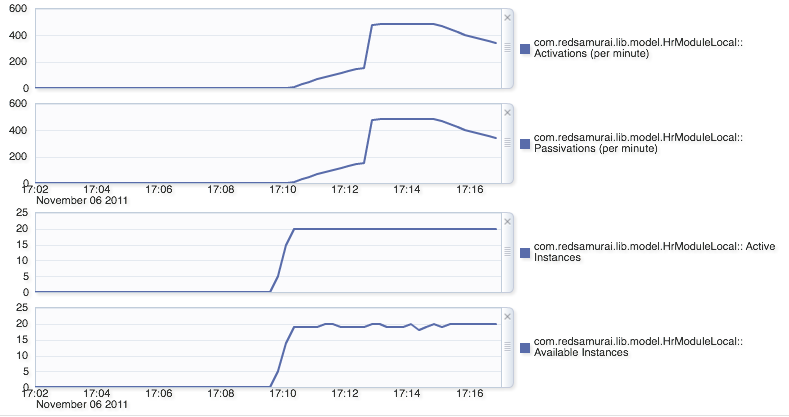 I want to know how to get the graphs that indicates the number of App Module instances loaded. 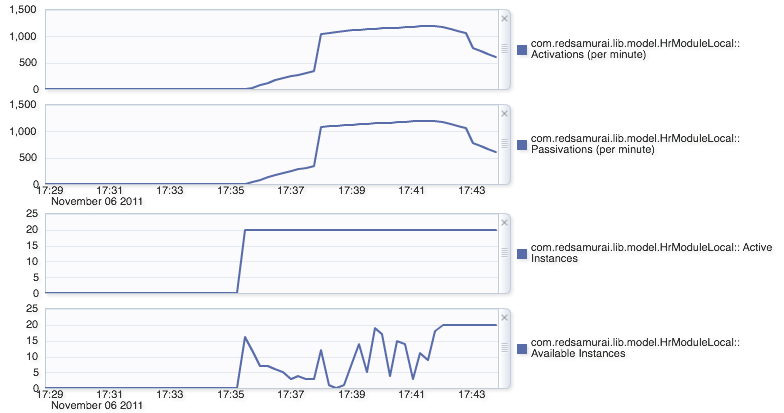 You should use Oracle Enterprise Manager to access these graphs. 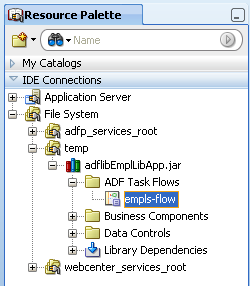 How do you connect JMETER with ADF?Is it possible to use JMETER with ADF?Please tell me. I've read your posts about stress tests, AM Passivation/Activation, AM Pool Settings and doconnectionpooling=true. And Thank you for these useful information. 1. 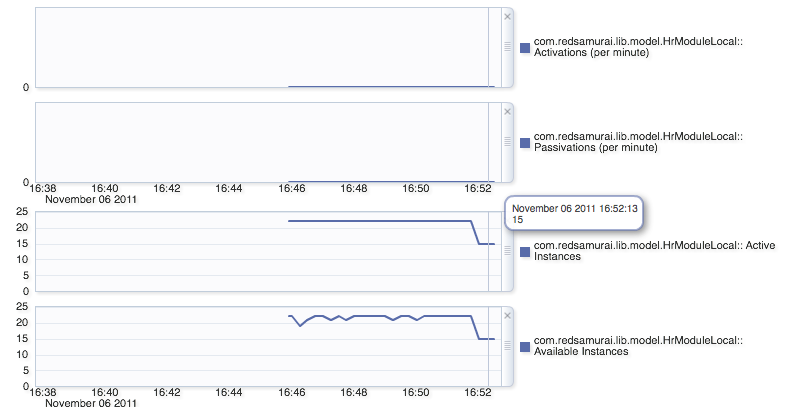 We have nested AMs under one RootAM. Is it enough to set these settings just to the RootAM? Or do we need to set it to all AMs. 2. We've encountering problems about max-user-connection. And would like to use doconnectionpooling=true (with disconnect_level=1). But when we set it like that, we get an java.lang.reflect.InvocationTargetException error. 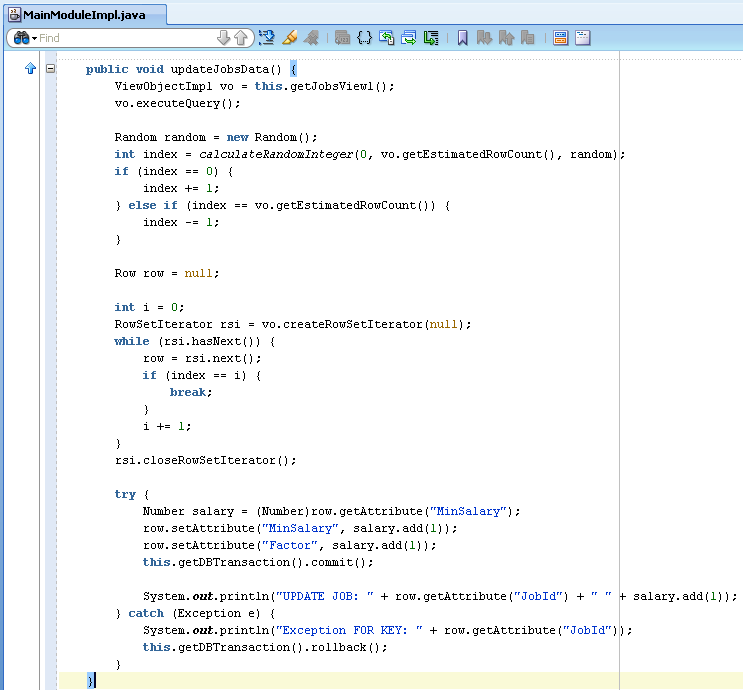 It throws when our App try to execute VOImpl method which locates under one of the child AM. FYI, we use MySQL for db, JDEV 11.1.1.4. 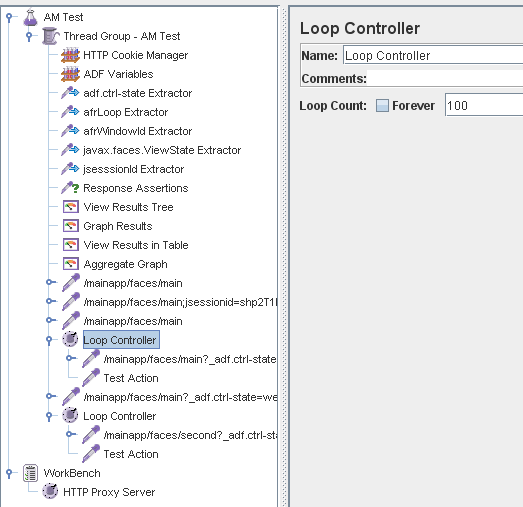 I set concurrent users and number of loops in JMeter. 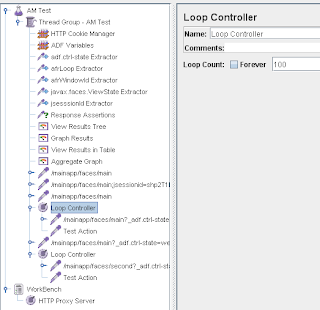 Then I calculate based on concurrent users and number of loops how many transactions it will execute (you can see this from JMeter log file as well). 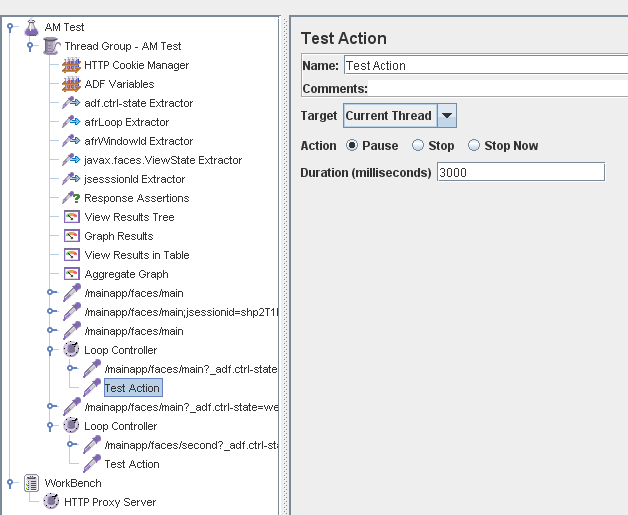 Time is approximate - it takes around 10 minutes for JMeter to execute each of the tests. 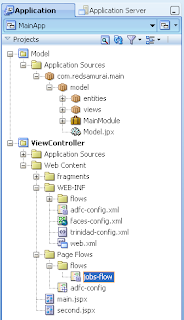 No, in ADF - Application Module takes DB connection, not the page. 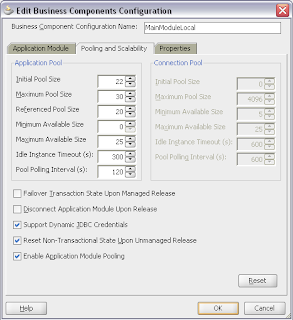 To minimize DB connections usage, you can enable DB pooling for AM. 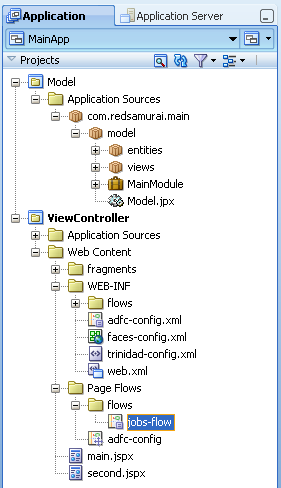 I already enabled application module pooling. 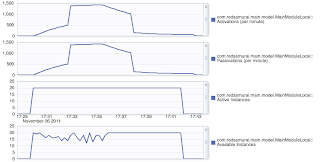 when i saw the number of taken connections when monitoring the server, each page i entered take a connection form the pool. could you please help me if i had to do another configurtions ? If every page takes new DB connection, this means application is developed badly. You should review code and fix errors. What errors exactly, hard to say, without reviewing your code. I need to call several iReport with JDBC connection . Now how should i config my appModule for best performance? I would like to know if the ADF framework can do a lazy passivation for performance improvement. Say I want the passivation to happen at the end of every request (fail over true) but only after the AM instance is released to the pool. So the passivation will not be a part of my request cycle. From the Doc i saw a similar flag PASSIVATE_DEFER_FLAG , but not sure how it can be used for this usecase. Good question, I will check it and follow up. Got anything on Lazy passivation stuff ? Not so fast, too busy with my work in the projects. This is on my todo list. Sure, thank you for the effort.